Riverside Resources Inc. ("Riverside" or the "Company") (TSX-V: RRI) (OTCQB: RVSDF) (FSE: R99), is pleased to receive new exploration results at its 100%-owned Cecilia Gold Project (the “Project”) in northeastern Sonora, Mexico. Recent rock sampling and mapping was conducted on the Cecilia 1 claim following-up on anomalous areas identified during the reconnaissance soil sampling survey which was conducted over the larger tenure acquired earlier this year. Initially, the exploration work focused on the Cerro Magallanes rhyolite dome complex where historical drilling, mining and other work delineated high-grade gold mineralization. The most recent work by Riverside has been at the Cecilia 1 claim which covers a large area (~50km2) of favorable geology that is bisected by several large regional structures that have been found to host gold mineralization. Over the past several months Riverside has completed a reconnaissance soil sample survey over the northeastern portion of the claim and followed this up with a sampling and mapping survey that included a Terraspec assisted alteration survey, Innovex geochemical testing, and assaying of selected areas. The soil sampling survey documented several, large linear anomalies that have now been field checked with initial sampling and mapping work. The most recent work has focused on four (4) new areas in addition to the main Cerro Magallanes target area therefore expanding the overall value of the Cecilia Project. The Casa de Piedra target is east of Cerro Magallanes on the recently added Riverside concession, Cecilia 1. The target zone comprises a 2 km long shear fault vein with abundant epithermal mineralization and textures. Casa de Piedra has not seen any exploration making it a high-profile drill target. This target was first identified through soil geochemistry in June 2018 where anomalous Pb, Cu, Te and Hg were noted. In the field the Casa de Piedra target is defined by a 30 m wide N-NE trending structural corridor of altered Cretaceous clastic sedimentary bedrock. Within the main mineralized structure, widespread sericitic, silica and kaolinitic alteration is common including buddingtonite alteration; buddingtonite being a clay often found in proximity to precious metal veins. The structural zone is infilled with quartz veining, quartz veinlets and stockwork and in some areas banded quartz, vuggy quartz and grey calcite. Textures in outcrop are dominated by intact-banded veins and silicified zones and only minor vein breccias. Transport of the clasts appears to be rotated but with minor displacement; anastomosing breccia veins are common in outcrop. Later carbonates are noted, and some carbonate appears to be leached from the matrix surrounding the quartz, leaving a stringy, net texture with residue of the Mn-oxides and crustiform quartz. This mineralized structure is cross-cut by northwest-trending rhyolitic dikes that do not appear to influence mineralization. Rock sampling (24) in this area returned one sample that assayed 0.9 g/t Au and also included other elements typical of the upper parts of hydrothermal veins. This shear vein is not unique, a second large vein system, Los Llanos described below. The Los Llanos target is located east of the Casa de Piedra vein shear structure east of the Cerro Magallanes peak. The Los Llanos target was first defined by reconnaissance and soil geochemistry where anomalous Pb, Cu and Zn were noted. In the field the Los Llanos target is defined by a 20-30 m wide structural corridor of altered sandstone presently mapped as being 1 km in strike length and trending northeast. Gold mineralization is found in narrow anastomosing veins sometimes as stockwork but primarily as a silicified zone marked by reddish-brown iron oxides. This corridor also hosts rhyolite dikes which are sometimes parallel to the mineralized zone but also cut the zone. To the best of our understanding no exploration work has been done in this area thus making it a newly discovered vein zone. Some evidence of placer mining was noted in the area suggesting gold may have come from this vein; further exploration work is warranted on the Llanos target. The Cruz target lies within a large structural corridor northeast of Cerro Magallanes within horst and graben structural terrain. This large northwest trending regional structure extends tens of kilometers and comes across the northeast portion of the Project, is visible on satellite images, and forms a major structural topographic feature in northeastern Sonora. At the outcrop level, mineralization is noted in veins and stockwork alteration zones of up to 100 meters wide. These zones comprise anastomosing quartz veins with breccia that generally strike N-NE (020) and dip vertical to steeply to the west. Within this 100 m wide zone stockwork show syntaxial and druzzy textures. Gold mineralization is associated with pervasive, widespread sericitic and silica alteration; sulphides are rare but noted in this area. Where these veins cut conglomerate bedrock wide areas of silicified material is noted, two out of seven samples taken from this area returned gold grades of 1.6 g/t and 2.3 g/t Au. These veins continue through the conglomerate into the adjacent granitic bedrock. Geochemistry in this area shows high Pb, Zn and Cu indicating mineralization in the northern portion of the concession may be lower down in a epithermal system. The Cruz II Target is located in the eastern portion of the Cecilia 1 concession. This target is also a structural corridor of silicification and veining currently mapped at about 2 km in strike length. The structure/vein strikes N-NE (020-030) and cuts through several sedimentary geological units varying in width from several meters to 20 m. Mineralized areas include anastomosing, stockwork or parallel veins with breccias; breccia is sometimes rounded but often angular. Terraspec analysis of altered rock shows pervasive silica and sericite alteration with illite in some areas. In hand sample the alteration is dominated by silicification and Fe-oxides. Individual veinlets are up to 30 cm wide with 3 to 5 parallel veins within a larger 20 m corridor. Stockwork veining, where present, is typically orthogonal and made more obvious by the hematitzation of rare pyrite, sphalerite and galena. Two of eleven samples from Riversides first pass of this area returned gold values of 0.5 g/t Au. Rock geochemistry also shows elements typical of a low-sulphidation epithermal system. These samples do not cover the entire target thicknesses and further excavations would be needed to extend continuity thus the widths are open and provide an indication of gold mineralization context. The new target areas on Cecilia 1 east and north of Cerro Magallanes provide the opportunity to discover bulk tonnage precious metal mineralization where vein systems of several kilometers in length have been defined. The map below (see Figure 1) shows the named zones on the Cecilia Project that have been defined by Riversides recent fieldwork. 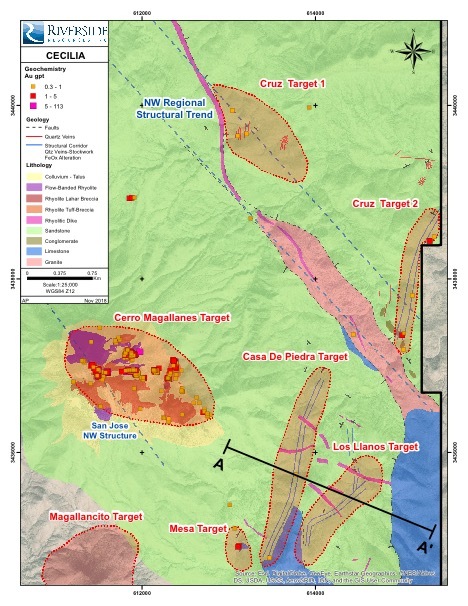 Figure 1: Shows geological mapping and gold values of the target areas and puts in context the new target areas locations in comparison to Cerro Magallanes. 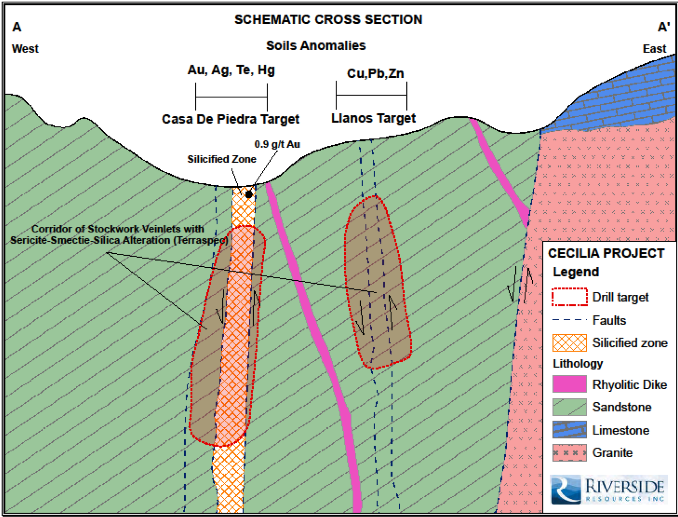 Figure 2: Shows a cross section of the Casa de Piedra and Los Llanos shear targets with the vertical dimension being extended to show some of the details for the drill targets. Rock samples collected were taken to the Bureau Veritas Laboratories in Hermosillo, Mexico for fire assaying for gold. The rejects remained with Bureau Veritas in Mexico while the pulps were transported to Bureau Veritas’ laboratory in Vancouver, BC, Canada for 45 element ICP/ES-MS analysis. A QA/QC program was implemented as part of the sampling procedures for the exploration program. Standard samples and blanks were randomly inserted into the sample stream prior to being sent to the laboratory. Riverside is an exploration company driven by value generation and discovery. The company has $2,000,000 in cash, fewer than 45M shares issued and a strong portfolio of gold-silver and copper assets in North America. Riverside has extensive experience and knowledge operating in Mexico and leverages its large database to generate a portfolio of prospective mineral properties. In addition to Riverside’s own exploration spending, the Company also strives to diversify risk by securing joint-venture and spin-out partnerships to advance multiple assets simultaneously and create more chances for discovery. Riverside has additional properties available for option, with more information available on the Company’s website at www.rivres.com.